In the past, my style & skill crush spotlights have gone to other blogs. But I'm making a special exception in this case for a real live place, in the real life world. It doesn't even have a website! 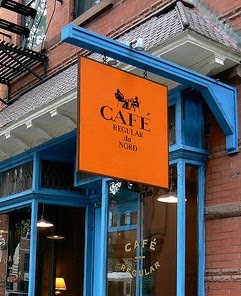 Presenting Cafe Regular Du Nord. 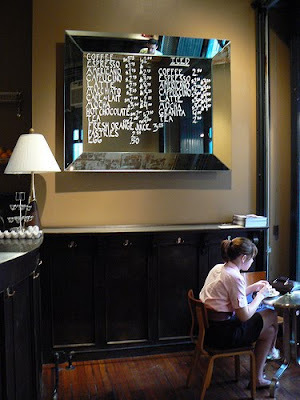 A tiny coffee shop in Park Slope, Brooklyn that will transport you to 1950's France the moment you spot the storefront. (And when I said little, I mean little. Its 400 sq feet.) I stumbled upon this place by complete accident and spent the entire 10 minutes I was there staring in amazement at this little gem. Unfortunately, I didn't have my camera with me so I had to 'borrow' these photos from the web. Let's start with the storefront. If you had shown me these two color swatches before I would have laughed at the thought and immediately thought of the New York Knicks. (Click here for the visual aid.) Well, I would have been dead wrong. The blue is just the perfect shade for a chic boutique. Its complemented by that vivid orange sign that sings to me 'come closer'. Then I crossed the threshold. I'm not kidding when I say it took my breathe away. These photos simply do not do it justice. There are so many reasons why this place should not work. Its cramped, loaded with stuff, mixes more colors than you can count on two hands, liberally employees "faux" finishes, etc. But when you put it all together you get something really magical. A perfect example of how when someone knows what they are doing - you can just throw out the rules. And then there are a few things that work so clearly that they can't be ignored. The fabulously high ceilings, the amazing chandelier that really "fills" the space against the distressed ceiling, the beveled mirror that doubles everything at a glance. Oh yea, the coffee was pretty tasty too. If you are in the area, I would definitely suggest you stop by for a cuppa. It looks heavenly - I will have to stop in. It looks lovely! I like the idea of writing on the mirror rather than chalkboards (I'm getting kind of sick of those). I like to write on my mirror too so I was digging their menu. Wondering how they got their text to be so opaque though - I can't seem to get that look no matter what I do with the chalk markers. Ok so the girls and I are definately going to check that heavenly coffee shop out. thank you so much for finding and sharing. I want a cuppa of that! ITA! The Knicks colors are just really beautiful on the exterior of this shop! WOW! For such a small shop everything is so large and gorgeous and does not look cramped at all! love the blue and orange. its that perfect shade of burnt orange! The cafe is adorable..!!! I wish it was in my city. Of course if it was I'd probably be there all the time. I just want to go and sit there for a few hours. I think I could easily do that...if I were in Brooklyn! Wonder what they use on the mirror?? I need to find it! Ah, it's lovely!! I might have to stop in the next time I go get my haircut by Rudy (do you still see him?). I refuse to give in to the "Connecticut" hairstyle. 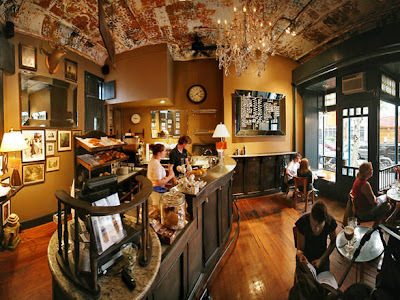 Where is this fabulous coffee shop?? I don't drink coffee, but I would love to go in there and catch up on my blog roll! I was not expecting the inside to look like that with only 400sqft. WOW!!! De-lurking. I always enjoy your blog and especially love your travel reports and pics. This post of yours prompted this idea.....I am right now in NY, midtown area. I have a few days to spend in NY. Do you mind recommending a few places I can visit while I am here? Stanford - its on Berkley - a very short walk from Fez. I was going to see Roxy for a while but the last time was kind of a bust so Im back on the hunt for someone new. Very frustrating. Anon - I'd be happy to give you some suggestions. What kind of places are you looking for? Midtown is probably not my speciality as I try to stay out of that area as much as possible but I may have some ideas. I love posts like this. MORE OF THESE PLEASE! Aw that place is very cute. I wish I had one like that near my house! I have a question concerning the cafe. Do they only sell coffee? That's all I could see on the mirror anyway. Just curious is all. Anon - it might be easier if you email me but here are some suggestions. If you don't mind traveling all over, Id definitely recommend going to different neighborhoods - each one has its own personality. Musuem of Natural History, Planetarium (these two are connected...they even have a nice little cafe in there for reasonably priced food). The area right around the musuem is also a great place to stroll around and look at architecture if you are into that sort of thing. Flatiron: Walk around the areawith a stop to see the Flatiron building, shop the market at Union Square and people watch the various skateboards. If you want to pick up some fun souvenirs, Fish Eddy's a few blocks away has some cool stuff. It all depends on your interests. I could write a book.  And then of course there is Brooklyn which in my completely unbiased opinion is a great place for someone looking to see something a bit different. That said, if this is your first time to NYC, you don't have to leave the island of Manhattan - there is loads to do there. Naz - They have a few pastries at the counter but I didn't try them. But yea, they pretty much just sell coffee. It's amazing that they can pay rent on just coffee lol. The place has so much atmosphere that I'm sure they must have plenty of customers. Thanks for sharing such an adorable cafe that I'd never had known about otherwise. The profit margin on coffee is ginormous - think of how much starbucks is raking in and they have a lot higher overheads with big stores and corporate offices, etc. Love your Blog!This post is amazing! get a look at my blog if you want. That lady sitting at the table looks so small next to the counter and mirror... if she wasn't in the photo I would not have realized the scale! That looks amazing! 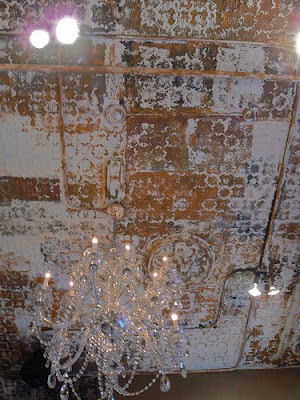 I love the decor, very eclectic! It's lOVELY...oh how i wish we had one of those near my house....we have something similar...but not that much character. The cofeeshop is looking cool. I love to take that cup of cofee. 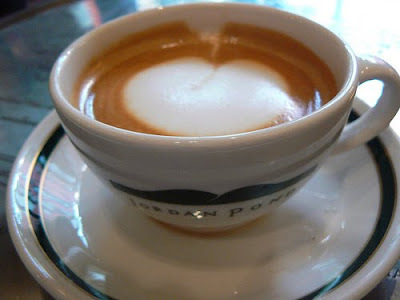 when i read this blog my mouth is watering to saw a cofee so i am going to cofeeshop near my house. Oohhh, I love this space! It's just so charming & has so much character.